You are here: Home » Let’s Get Sprouting! Well, okay…I will have sprouts. In a few days. 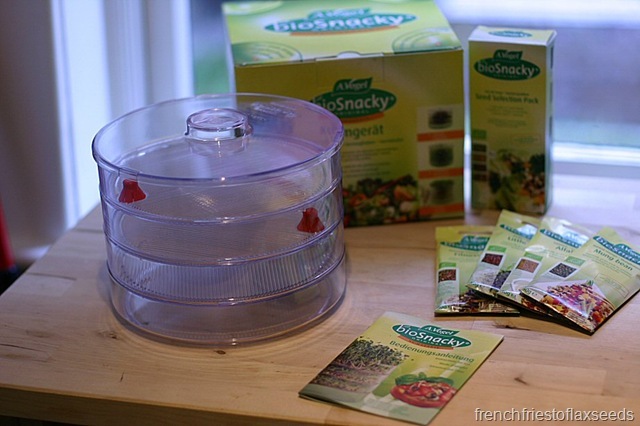 All thanks to my brand spanking new bioSnacky Sprouter from A.Vogel Canada. You see, I am one of 30 Canadian bloggers taking part in the bioSnacky Sprouts Challenge (which you can follow on Twitter with the hashtag #bioSnackySprouts). 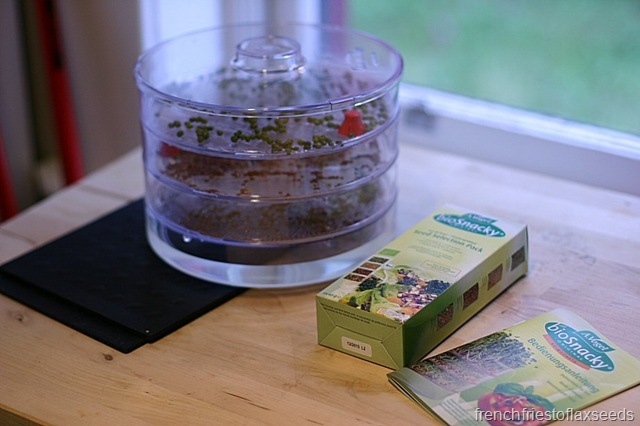 Yes, I was one of the lucky bloggers chosen to participate in this 10 day sprouting challenge. I think it’s going to be fun – living in an apartment without a balcony means I don’t have much opportunity to grow food. But I figure that sprouting is something I can do in my little space. 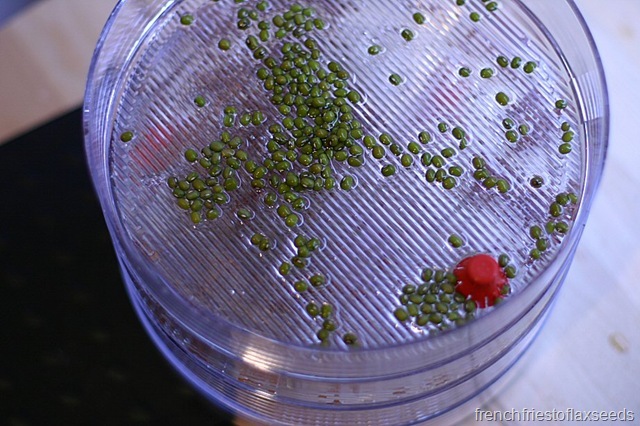 I’ve got 3 varieties of seeds germinating away in my kitchen right now – mung beans, alfalfa, and radish. There was also a package of mixed seeds, but since there were only 3 trays to sprout in, I decided to save those for later. Who knows – I might be able to start those before the 10 day challenge is over. 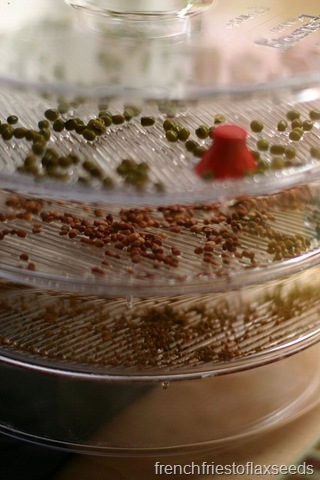 The sprouter itself is simple to use – just spread out your seeds, pour in a bunch of water, and let it run through each of the trays. Once that is done, empty the tray at the bottom of the sprouter, and let it sit and do its thing. Although, I will say I don’t know how much point there is in making sure you spread the seeds evenly over the tray before you add water, because they just float around and settle in clumps anyways. I say spread them out after the water has run through the trays. 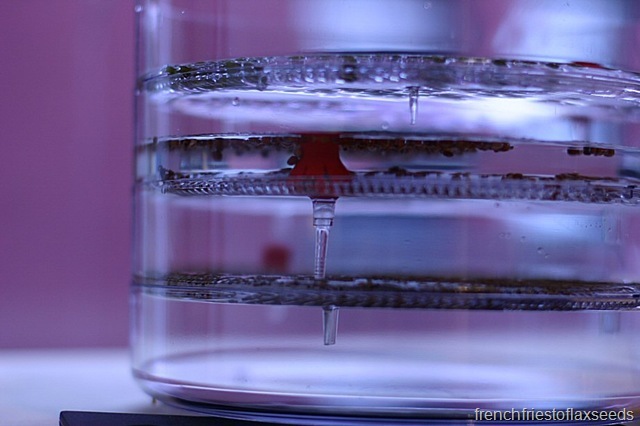 Can you see the water running between the 2nd and 3rd tray? Aside from the fact that it’s fun to grow things. sprouting seeds is also a great way to amp up your nutrition. Sprouts are low calorie (think 10 kcal per 1 cup serving), full of vitamins and minerals (think Vitamin C, B2, B5, folic acid, copper, zinc, and magnesium), and a great source of phytonutrients such as phytoestrogens and saponins (think antioxidant, anti-cancer, and cholesterol lowering properties). They are quick to grow, and ready to eat – just throw them in a salad, use them in a sandwich or burger, or add them to a stir fry. Not only do I think it will be fun to watch my little sprouts emerge from their seeds, but I’m also looking forward to finding some creative ways to use them in my meals. I’m already pondering how they would taste in a green smoothie 🙂 If you have any awesome sprout recipes, send them my way! Be sure to follow all the sprouting action on Twitter (hashtag #bioSnackySprouts), or over on the A.Vogel Canada Facebook Page. 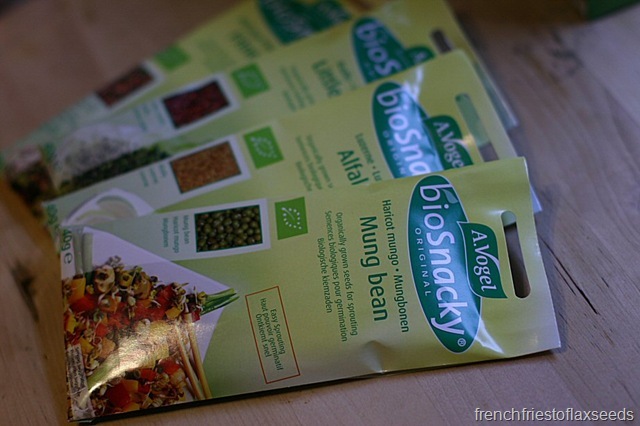 Disclaimer – I received all of the bioSnacky spouting supplies free of charge from A.Vogel Canada as part of a promotion for Canadian food bloggers. All opinions are, of course, my own.